Opening weekend $22.079 million on 1797 screens. 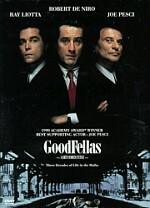 Nominated for Best Supporting Actor-Paul Newman; Best Cinematography; Best Art Direction-Set Decoration; Best Sound Effects Editing; Best Sound; Best Original Score-Thomas Newman. It took director Sam Mendes about three years to produce a follow-up to 1999’s American Beauty, his Oscar-winning debut. With Road to Perdition, it seemed like Mendes did would he could to stack the deck in favor of another Oscar. Between the two of them, stars Tom Hanks and Paul Newman account for three Academy Awards – five if you count Newman’s two honorary prizes – and many crewmembers earned their own trophies. Perdition won’t repeat the performance of Beauty, but it actually may offer the more deserving film. I liked Beauty but thought other flicks from 1999 seemed stronger. While I don’t know if I’d call Perdition the best 2002 had to offer, it seemed like a generally solid and well-crafted movie. Set in the winter of 1931, we meet the family of Michael Sullivan (Hanks). A hitman for local gang boss John Rooney (Newman) – who also acts as his surrogate father - Sullivan keeps his business distant from his wife Annie (Jennifer Jason Leigh) and sons Michael Jr. (Tyler Hoechlin) and Peter (Liam Aiken). However, young Michael develops more of a curiosity about dad’s job. When the family attends a wake, the plot thickens. Finn McGovern (Ciarán Hinds) clearly blames the Rooney organization for his brother’s death. When Finn pops off at the wake, Sullivan and Rooney’s semi-screw-up son Connor (Daniel Craig) go to talk with Finn. Michael Jr. stows away for the ride, and when matters turn unpleasant, he witnesses these actions. This makes the Sullivans a marked family, as the Rooneys can’t afford to have an eyewitness on the streets. I don’t want to spill all of the plot surprises, but much of the film follows Sullivan’s attempts to fix things. In time, Rooney hires crime photographer/hitman Maguire (Jude Law) to go after the Sullivans. For the first act of Perdition, I found it difficult to get into the film. While those portions seemed well crafted, they simply didn’t do much to involve me in the story. I thought the flick came across as watchable and profession but little more than that. However, as the plot thickened, the movie slowly started to draw me into it. Perdition doesn’t seem like a slam-bang package that immediately makes an impact on the viewer. Quite a lot happens in the first act, but it still took me a while to warm up to the piece. Once that occurred, I found Perdition to offer a rather involving and ultimately moving flick. A lot of the credit goes to the visual style executed by Mendes and director of photography Conrad L. Hall. Simply put, you’ll be hard-pressed to find many movies that look better than Perdition. However, the visuals don’t exist in a vacuum; the flick doesn’t provide style without substance. Instead, the look of the flick clearly serves the story. The moody cinematography creates a sensibility that works extremely well for the story it tells. In particular, one shoot-out filmed in the rain seems terrifically memorable. As one might expect from such a stellar cast, Perdition also features solid acting. Hanks plays against type to a degree. He doesn’t portray a genuine bad-guy, as Sullivan seems a bit chilly but not genuinely nasty despite his career choice. Some have seen the role as a great departure for Hanks, but I don’t agree. He often plays low-key and fairly stoical personalities like Sullivan; the difference stems from the fact the others don’t kill for a living. Remove that from the equation and Sullivan doesn’t seem all that different from other Hanks roles. Nonetheless, I appreciate that the actor took on a potentially unpleasant character. Hanks didn’t try to make Sullivan particularly warm or likable, choices that helped serve the part. Though Newman earned an Oscar nomination for his work as Rooney, I think the best acting comes from Law. His work as Maguire doesn’t require much dimensionality, but he offers a stark portrayal of a mole-like little man. As he dispenses with his usual charm and savoir-faire, Law makes Maguire much more memorable than the character probably should warrant based on screentime. A dark and involving drama, Road to Perdition seemed a little slow at its start. However, it eventually turned into something fairly special. Put this flick down as one of 2002’s better releases. 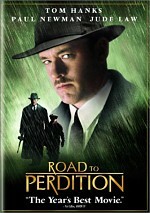 Road to Perdition appears in an aspect ratio of approximately 2.35:1 on this single-sided, double-layered DVD; the image has been enhanced for 16X9 televisions. Mostly the picture looked good, but some niggling concerns made it somewhat problematic at times. Sharpness usually appeared fine. Occasional wide shots came across as a little soft, but those examples didn’t occur frequently. Usually the movie came across as accurate and distinct. While I noticed no concerns related to jagged edges or moiré effects, Perdition suffered from some fairly prominent edge enhancement at times. The haloes occasionally gave the movie a moderately fuzzy look. As for print issues, the film featured some light stylized grain, but otherwise it mostly seemed clean. I saw the occasional speck but no other defects. An extremely monochromatic flick, Perdition provided seemed almost black and white at times. While the palette might not be quite that restricted, the movie certainly didn’t present any bright or vivid tones. That seemed fine with me, as the colors reflected the mood of the piece. For what we see, the hues came across as rich and distinctive, and I noticed no problems related to noise, bleeding, or other issues. Black levels appeared nicely deep and dense, and shadow detail looked terrific. Low-light sequences were appropriately opaque but they never became too dark or impenetrable. Road to Perdition mostly looked fine, but the excessive edge enhancement knocked the image down to “B”-level. While the Dolby Digital 5.1 soundtrack of Road to Perdition demonstrated no substantial flaws, it also did little to make it stand out from the crowd. That shouldn’t come as a complaint, however, as the movie’s somewhat restricted soundfield made sense for the story. The audio remained heavily oriented toward the forward channels. In that domain, music showed good stereo imaging, and effects presented accurate placement. Those elements also blended together well, and information panned smoothly across the speakers. Surround usage mainly offered atmospheric element, and those seemed appropriately involving. For example, the shots at the brothel brought the spectrum vividly to life, and gunfire sequences provided a solid sense of environment. The soundfield didn’t seem terribly accurate, but it remained appropriate for the story. Audio quality appeared positive. Speech seemed natural and concise, and the lines presented no issues related to edginess or intelligibility. Music was bright and vivid, and the score demonstrated good range and punch. Effects sounded clean and accurate, and they also featured very solid bass response. The low-end elements provided fine depth and never appeared loose or boomy. Ultimately, Road to Perdition seemed like a good soundtrack, but not one that made it to “A”-level. This DVD release of Road to Perdition provides a pretty good collection of supplements. We start with an audio commentary from director Sam Mendes, who offers a running, screen-specific piece. I thought his track for American Beauty seemed above average, but it didn’t particularly enthrall me. However, Mendes’ discussion of Perdition provides a substantially stronger affair. The director covers many of the expected nuts and bolts issues as he talks about working with the cast, dealing with challenges of the period setting, visual design and other topics. While those notes seem good, Mendes’ remarks about the story, the characters, and his intentions as a director appear especially terrific. He really gets into the symbolism and the different choices he made. These add a lot to my understanding of the flick and my appreciation of it. Overall, Mendes provides a very strong commentary. Next we locate a set of 11 deleted scenes. Presented anamorphic 2.35:1 with Dolby Digital 2.0 audio, these run between 55 seconds and 181 seconds for a total of 21 minutes and 59 seconds of footage. Some of the clips extend existing shots, and they tend to add a little character information. We also see Anthony LaPaglia as Al Capone in an entertaining but insubstantial snippet. None of the deleted scenes come across as significant, but some of them provide intriguing material. The deleted scenes can be viewed with or without commentary from Mendes. Unfortunately, this chat doesn’t seem as useful as the one that accompanies the film itself. Actually, Mendes offers some decent notes about the scenes and helps relate how they would have accompanied the story. Unfortunately, he doesn’t always tell us why he omitted the segments. Mendes’ statements appear generally informative but not terrific. One interesting note: all of Mendes’ commentary – whether during the feature itself or during the deleted scenes – can be viewed with subtitles. These appear in English, French and Spanish. French and Spanish text also appears during the subsequent documentary and the deleted scenes. After this we get an HBO special called Making of Road to Perdition. The 25-minute program features the standard mix of movie clips, shots from the set and interviews. We hear from director Sam Mendes, actors Tom Hanks, Jude Law, Paul Newman, Tyler Hoechlin, Jennifer Jason Leigh, Daniel Craig, and Stanley Tucci, director of photography Conrad L. Hall, producers Dean and Richard Zanuck, production designer Dennis Gassner, executive producer Joan Bradshaw, costume designer Albert Wolsky, and special effects coordinator Allen L. Hall. Although “Making” suffers from the usual glossiness found in this sort of piece, it still includes some good moments. Yes, we hear lots of praise for the different participants and learn what a great film Perdition is, and we also get many simple plot points. However, some decent information about visual design and other elements crops up, and the piece includes many nice behind the scenes images. The latter present the best elements and help make “Making” a decent little program. After a 32-second ad for the CD Soundtrack, we find some text extras. Cast includes biographies for Tom Hanks, Paul Newman, Jude Law, Jennifer Jason Leigh, Stanley Tucci, Daniel Craig, Tyler Hoechlin, and Liam Aiken. Filmmakers provides listings for director Sam Mendes, producers Richard D. Zanuck and Dean Zanuck, executive producers Walter F. Parkes and Joan Bradshaw, director of photography Conrad L. Hall, production designer Dennis Gassner, editor Jill Bilcock, screenwriter David Self, costume designer Albert Wolsky, and composer Thomas Newman. As with most DreamWorks DVDs, these entries tend to resemble annotated filmographies, but they provide reasonably good information. Another typical DreamWorks element, the Production Notes include quite a lot of solid facts. They summarize the film’s creation quite well and offer a fine examination of the flick. The booklet provides a short alternate text that doesn’t do much to illuminate anything. Finally, in the Photo Gallery we find 50 shots from the film. These seem to be unusually high quality, and they attest to the great look of the movie. Normally I don’t like pictures that don’t offer a look behind the scenes, but these seemed sumptuous. Directors don’t usually follow up Best Picture-winning efforts with something superior, but Sam Mendes did so with Road to Perdition. A marvelously photographed and very well executed drama, the film progresses a little slowly but works quite nicely in the end. The visuals suffered from a bit too much edge enhancement, but otherwise the image looked solid. Sound seemed positive, and the DVD’s extras added some nice material to the package. A stirring and compelling effort, Perdition definitely merits my recommendation. Buyer’s note: three different DVD versions of Perdition exist. In addition to the one I reviewed here, we find a fullscreen edition and a DTS release. The pan and scan rendition would seem to be especially egregious in this case given the film’s superb photography, but the DTS package may entice some people. 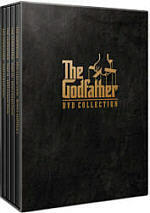 From what I’ve read, it contains all the same extras except for the HBO special. I’ve not seen the DTS release so I can’t compare the quality of the pair, but I wanted to mention its availability.